Watch Steve Jobs-narrated drone flight over Apple's "spaceship"
The iPhone 6S, Apple TV 2, and iPad Pro aren't the only things Apple's been working on. 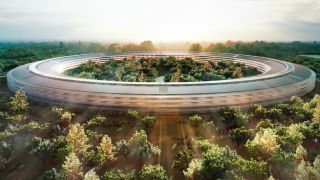 Since 2013, an enormous circular campus that looks more like a spaceship landing than a tech headquarters has been under construction in Cupertino. While the building isn't due to be finished until next year, a new video taken from a drone fly-over has been released, complete with a slightly creepy commentary from the late Steve Jobs. Shot by YouTuber Duncan Sinfield using his DJI Inspire 1 drone, the video combines footage of the site taken on August 1, 2015 with footage from September 1, 2015, and overlays audio from Steve Jobs' presentation to the city council for the proposed development back in 2011. It's a curious peek behind the wire at a building that will almost certainly draw Apple fanatics the world over to gawk at it's undeniably stunning design. Not everything Cupertino touches turns to gold, which is why Apple is working hard to make Apple Music better.